Canon has unveiled the 4K concept camera at its five-yearly expo in New York, a futuristic device capable of unbelievable video shooting quality four times that of current 1080p standards. Although Canon sadly has no plans to release the fully working4K concept camera, the snapper's 60fps 4K resolution video shooting, made possible by its 2/3-inch, 8-megapixel CMOS sensor, offers an exciting insight as to where the future of digital cameras is moving in the coming years. 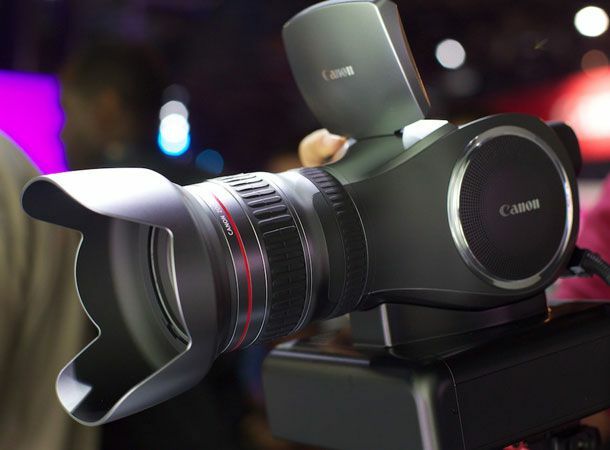 The 4K concept camera was not alone at Canon's expo in terms of awe-inspiring new technology joined by an 8K high-resolution LCD units and the world's largest CMOS image sensor measuring in at aheavyweight 202 x 205mm. T3 will be on hand when Canon's twice a decade expo rolls up in Paris next month to bring you a more in-depth look at the 4K concept camera and all the other futuristic tech delights that will shape camera use for years to come. Check back to T3.com and the T3 Twitter and Facebook pages on October 12th for all the coverage from the French leg of Canon Expo.